1. 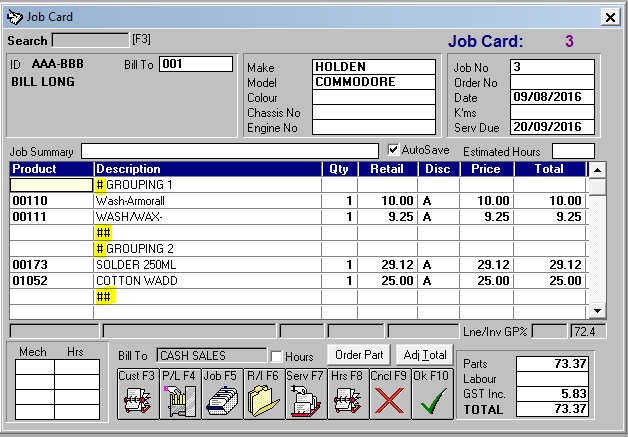 In the workshop screen you can press the order button while focused on a product line and it will open a supplier order to the appropriate supplier and load all the parts with the same supplier from the job card to the order screen. Set WSSub.rdl as the JC and WSIE layouts in Setup Workshop. When creating a JC / WSIE in the parts grid, you can now define groupings that will show subtotals on the rdl. Replace <Heading> with whatever you want your heading to be. Following the heading you can put in parts, descriptive lines etc etc.